Yep, Jacquie is at it again. She's heading up another UFO challenge with some prizes to inspire but is also encouraging everyone to plan rewards for themselves. I am in the middle of finishing the mother of all UFOs at the moment (it needs 27 more lines quilted), I have some other old projects I'd like to get done, some newer things that need to get done, and I'm feeling like I'm making progress. My reward. Make that multiple, rewards. In my comment on Jacquie's post, I said I would start my 5 year old's monkey quilt. But then I remembered yesterday that I have been telling myself for months that as soon as I finish my watercolor quilt I'm going to start a Dear Jane quilt. And finally, I would really like to make the skirt from Alabama Stitch Book too. So, more projects that will most likely take a while to finish. Oh well, that's part of the fun. So--I have 8 UFOs. I wonder how many of them I can finish before May 15? Do you have any unfinished projects? Head on over to Jacquie's and join in the challenge! Good for you finishing your UFO's before starting a new project! 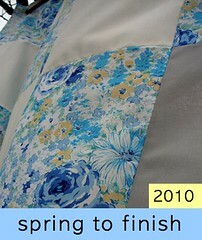 I am looking forward to seeing the finished quilt soon! Good luck in finishing as many UFOs as possible before May 15th. But I'm not quite 94, and I read it. :-) Thank you! It was a fabulous birthday. And, as always, I love reading/seeing what you're up to!